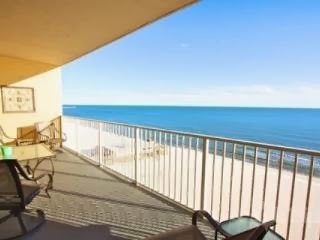 This absolutely delightful gulf-front beach rental is in the heart of Gulf Shores at Seawind Condominium, located within walking distance to all that Gulf Shores has to offer. This bright and upbeat home says "vacation at the beach" in every room! The fully equipped kitchen has granite counter tops and stainless steel appliances. Dining area seats four and there are two bar stools for additional seating. The comfortable living area has two recliners and a sofa sleeper. There is a 42" flat screen TV and DVD player. The master bedroom has a king sized bed with new pillowtop mattress and 26" flat screen TV/DVD player. Second bedroom has a queen sized bed with new pillow-top mattress and also has a 26" flat screen TV/DVD player, plus.